It was the fall of 2015, and football season was just getting started when the news broke. For weeks, people had been getting curious: Why is Bevo XIV not at the game? Why is he sitting so often? Is something wrong? ¶ As it turns out, there was. On Oct. 16, 2015, UT announced that Bevo XIV had died. “Bevo XIV was so much more than a traditional mascot—he was so big and strong, but he had such a sweet personality and a gentle soul,” said Ricky Brennes, BS ’00, Life Member, executive director of the Silver Spurs and Bevo XIV’s regular traveling partner. At 13 years old, the steer who had served as Texas’ mascot since 2004 succumbed to a rare and untreatable disease called the Bovine Leukemia Virus (BLV). For many, it was the first they had heard about the virus that affects around 5 percent of infected bovine. But for a group of researchers at UT Austin, it was more than familiar. 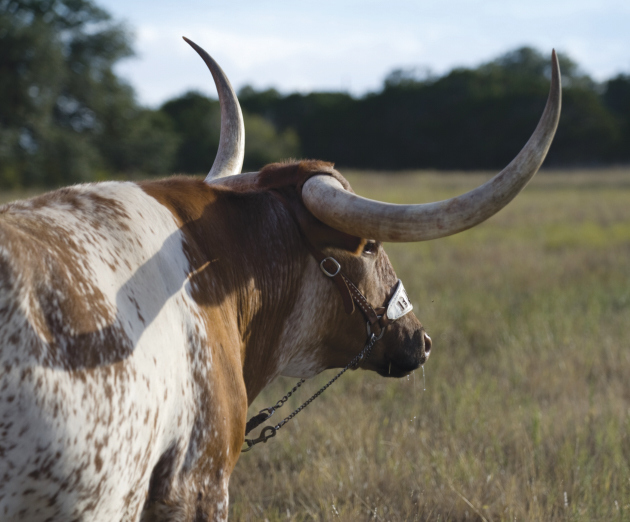 Since 2009—long before Bevo XIV was diagnosed—UT associate professor of molecular biosciences Christopher Sullivan and his team have been studying the bovine virus, which infects dairy and beef cattle’s blood cells and mammary tissue. It’s transmitted among cattle primarily through infected blood and milk. And now, three years after Bevo XIV’s death, they’ve made a key discovery that may be a useful tool in the fight against hepatitis C, a common human tumor virus that causes inflammation in the liver, sometimes leading to severe liver damage. In July, the researchers published the results of their studies in Proceedings of the National Academy of Sciences that shows the cattle virus can be used to develop treatments that combat hepatitis C, which kills nearly 20,000 Americans every year. While it’s unclear why some people naturally clear the virus, it is a disease that kills more people than HIV, tuberculosis, and pneumonia combined. When BLV is at work in cattle, it uses a naturally occurring protein to its own benefit, producing viral RNAs that contribute to the cancer’s spread. When the researchers put the protein to the test against hepatitis C, they discovered that the protein from BLV curbed the replication of the hepatitis C virus in the human body. This could have relevance to an emerging drug class for the hepatitis C virus that is currently in phase II clinical trials. Sullivan and his team’s research could help improve how this medication targets the hepatitis C virus’ defenses. “This process we stumbled into could make this a stand-alone drug therapy,” Sullivan says. Sullivan says this discovery could have a greater reach than just combating hepatitis C. By learning how the human body uses the BLV protein to its benefit, researchers can potentially determine how to control the body’s immune response—which is the reaction of its cells and fluids to the presence of a foreign substance. For example, in cases of cancer treatment and immunotherapy, a patient’s immune response might be turned up to help the body find and attack more cancer cells. Sullivan says some of these possibilities are already showing promise in the lab.